The Aston Martin One-77 Bicycle: If James Bond Was A Cyclist, He'd Ride This! The Aston Martin One-77 Bicycle – If James Bond Was A Cyclist, He’d Ride This! Aston Martin is famously known for being the sports car of choice for James Bond, but now the carmaker has teamed up with Factor Bikes to create a two-wheeled version of their iconic (and expensive) One-77 Coupe — the One-77 Cycle. Clearly designed for the super-rich cyclists among you (or British secret agents), the One-77 Cycle is described as “the world’s most technologically advanced road bicycle” and features a high-tech computer system, a complex array of sensors, and a carbon fiber frame to keep the weight down. The bike’s computer is not only advanced, but delivers a whole lot more information than the standard speed and distance traveled. The system provides a menu of over 100 specific measurements, including crank torque, crank force and leg power, which are even sub-divided into right and left leg subsections. Other information provided included wasted leg power, rear wheel speed, acceleration, and rate of ascent — it’s not so much a computer, but an all-in-one sports laboratory for cyclists. It also sports a Bluetooth connection to connect with and share data to smartphones and other devices. Of course, a bike that is made from carbon fiber, has a high-tech computer and integrated LED lights is going to come with a high price tag, so you won’t be surprised to learn that the One-77 Cycle costs $39,000. 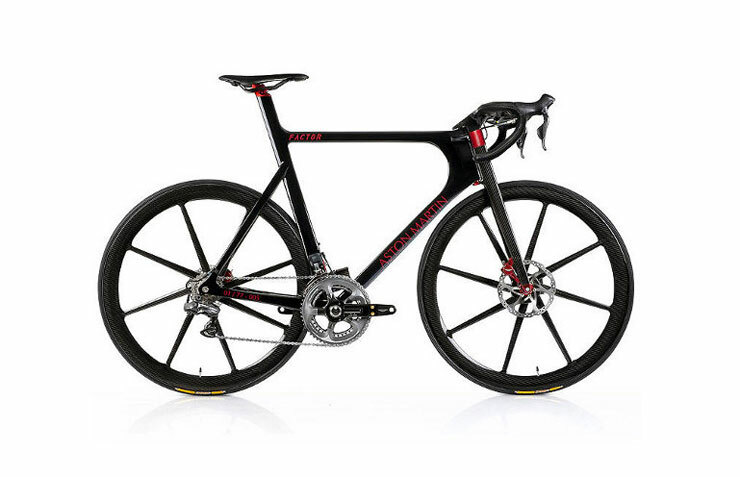 However they are are custom-made, so if you were to buy one, your measurements would be integrated into the construction process, allowing Factor Bikes to optimize the build to your personal requirements. There are a limited number (only 77 – see what they did there! ), so if you are interested, you better be quick. Most technically advanced bike? You have to be joking. It uses the same pilot position and same derailleur system that bikes have used since the late 1800s, instead of a CVT transmission like the NuVinci and the recumbent posture (which was so effective that bike races had to ban it because it always won) This bike is a high tech overpriced antique reproduction. Just because something is overpriced does not mean it is good. The Aston Martin One-77 Bicycle - If James Bond Was A Cyclist, He'd Ride This! Aston Martin is famously known for being the sports car of choice for James Bond, but now the carmaker has teamed up with Factor Bikes to create a two-wheeled version of their iconic (and expensive) One-77 Coupe -- the One-77 Cycle. Clearly designed for the super-rich cyclists among you (or British secret agents), the One-77 Cycle is described as "the world’s most technologically advanced road bicycle" and features a high-tech computer system, a complex array of sensors, and a carbon fiber frame to keep the weight down.